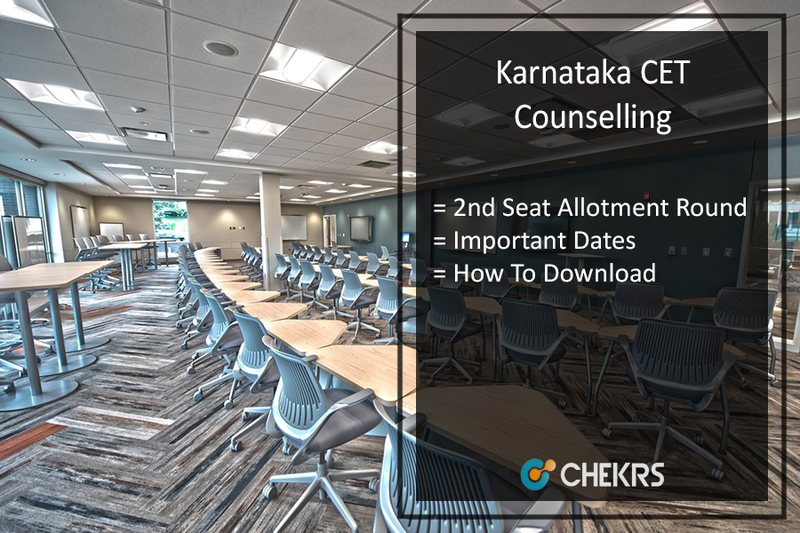 Karnataka CET 2nd Counselling 2019 Karnataka Examinations Authority (KEA) has already started the first round of KCET Counselling 2019 and as per revised schedule, the dates for the first round of counselling are extended up to 7th July. Accordingly, the schedule for KCET 2nd Round Counselling is also revised and now the process of exercising the option, modifying or deleting for second counselling is going to be conducted from 11th July onwards. Therefore in regards to more precise details of KCET Second Round Counselling Dates, procedure, and all other related information check the article below. Karnataka Examinations Authority has announced the notification of Karnataka CET Counselling 2019 for admission in UG medical, engineering and pharma courses. Therefore applicants whose name appears in KCET Merit List 2019 will be called for the counselling process. The authority has already conducted the first counselling, however, the dates to exercise the correct options of choices are extended till 7th July. After the completion of the 1st round, candidates who are not allotted any seat can participate in KCET 2nd Round Allotment as per schedule. KEA conducts its KCET exam every year, where a large number of students seeking admission in UG Medical, Engineering or Pharma courses appear in the exam. The authority has already conducted the first counseling round and Karnataka CET 2nd Round Counselling was delayed as per the previous schedule and now it will be conducted from 11th July onwards. Due to the announcement of fresh matrix dates the second counselling was delayed. In the process of KCET 2nd Round Counselling 2019, the provision to modify, delete, reorder, options for candidates will take place from 11 am on July 11 to 11 am on July 14 and results will be announced on July 17. Thus after completion of the first allotment ll the unfilled, surrendered, fortified, cancelled and newly added seats will be offered in the second round. Thus candidates who have entered 2-3 choice and has not been offered a seat in the 1st round is eligible to participate in KCET Second Round Counselling. Karnataka Examinations Authority has made announcement of the Karnataka CET 2nd Allotment. Therefore candidates can check it by going through the below steps. Karnataka Examinations Authority (KEA) has started the counselling process and the authority is going to Karnataka CET Second Round Counselling from July. Therefore at the end of counselling, the authority will release KCET Second Round Allotment as per choice, merit, category and upon availability. Therefore the authority will declare the result through its portal and we will also update you here with the same. For more details stay tuned to our portal. In the case of any query or review place your comments below and we will revert you in a short while. For the adding options for the 2nd round, you can check the instructions for the allotment. The link is given in the article.